When the snow falls, your safety on the streets is our top priority. Whether an inch of ice or 2 feet of snow, La Vista's Public Works crews know how to respond when inclement weather becomes an issue. During a major storm, we will issue periodic updates to the local media, through La Vista e-newsletters, and on our Facebook page and Twitter account. Good morning, La Vista. In case you were hoping to visit the Community Center or Library today, both facilities are closed. If you have a reservation at the Community Center, staff will work with you to reschedule or get you a refund. Crews are working to clear parking lots now, which in some cases means they have to haul it away, so those operations will take much of the day. Also, as you dig out this morning, please ensure that you don't leave snow in the street when you're finished clearing your driveway and sidewalks. When snow is left in the street, our plow crews have to come through again. Please give our employees a friendly wave and hearty thanks for their work! The La Vista Public Library will be closed today. The La Vista Community Center will be closed Saturday, February 23, which means all activities, including basketball games and the tax service have been cancelled. Public Works crews will start 12-hour, continuous shifts at noon on Saturday, February 23, and will remain in snow removal operations until the storm is complete. We will have plows in each district throughout the storm. If this storm produces the winds that have been forecast, crews will treat only intersections until winds are done. In anticipation of the coming snowstorm, effective at noon on Saturday, February 23, the City of La Vista will be in a snow emergency until 6 p.m. on Sunday, February 24. Please move all vehicles from residential streets to allow plow crews to clear a path. If needed, vehicles can be parked on non-hard surfaces during the storm in order to get them off the street. Likewise, motorists should not park on the street when they arrive home from work this evening. Vehicles left on the street will be ticketed and/or towed. 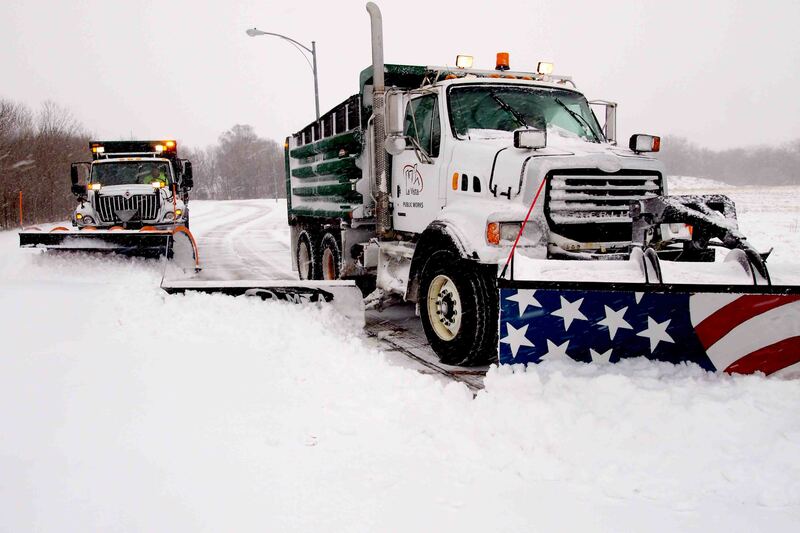 Learn how La Vista determines which roads receive priority during snow removal and how the City plans to ensure all streets are cleared during a snow event. Although we do our best to ensure every street is treated and/or cleared in a timely fashion, we may occasionally miss one. Find out how best to report a missed street. Maps, contact information, definitions and additional resources. When do you issue a snow emergency? When do you start plowing after a storm begins?